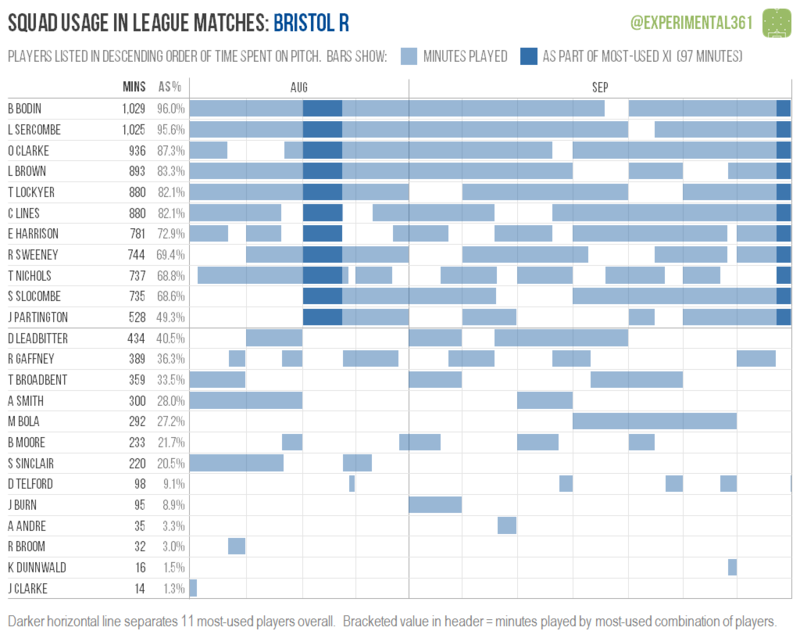 Today I’m switching another graphic from last season back on. 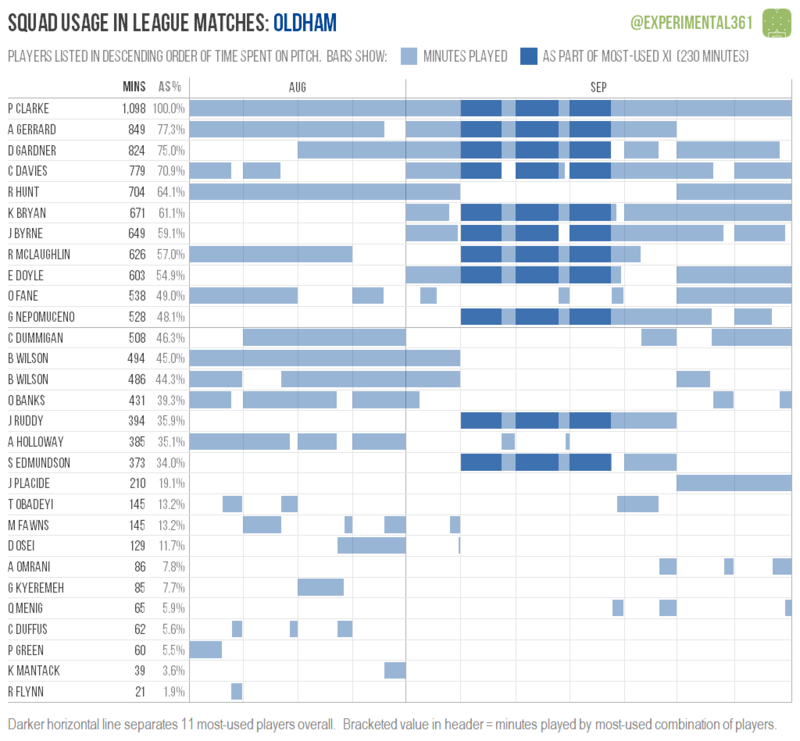 This one looks at how each club has used their squad, and in addition to individual graphics for every team I’ve also created a summary of the division as a whole. 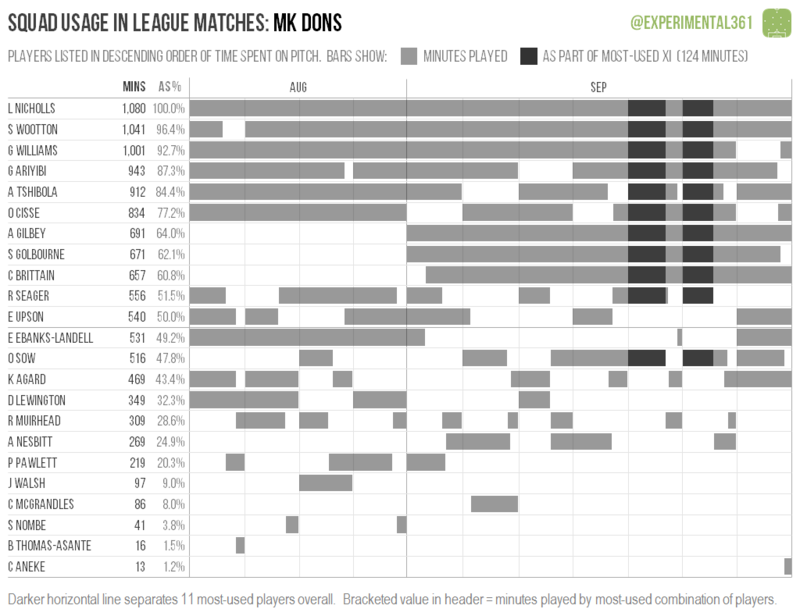 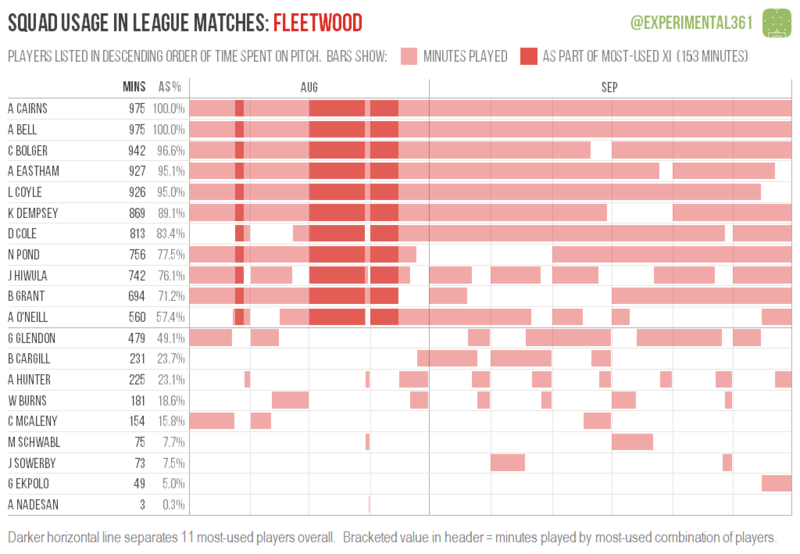 It’s sorted by how many different players each club has used (with the number who started a match used as a tie-breaker), but also shows the average number of changes to their starting XI, the number of minutes played by their most-used combination of players so far and how many players have been ever-present. 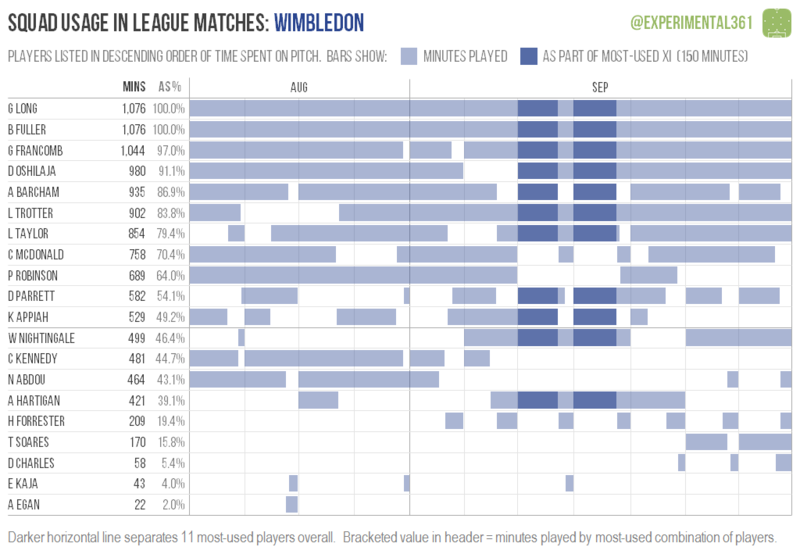 This all applies to league matches only. 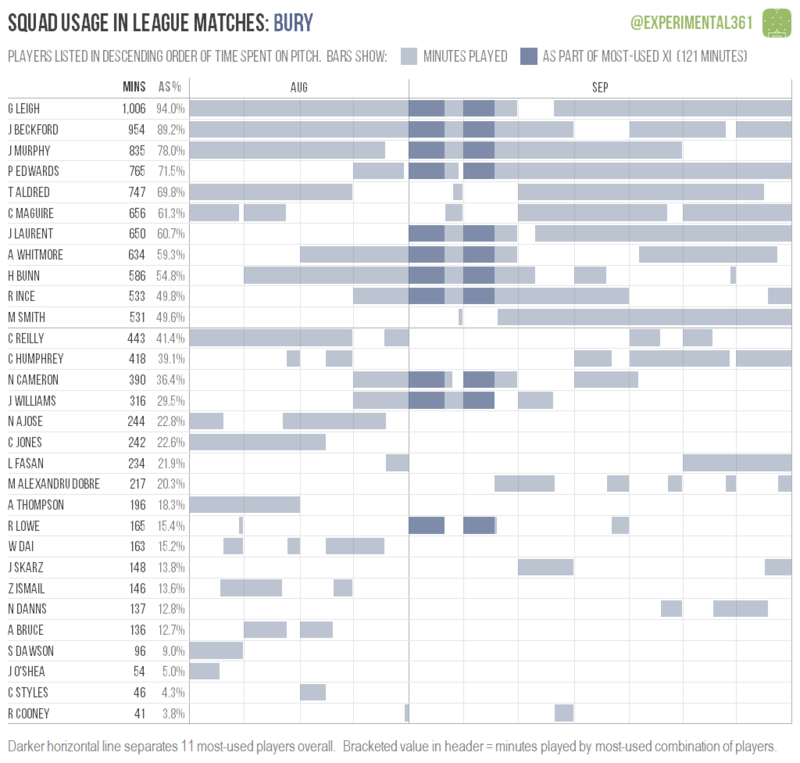 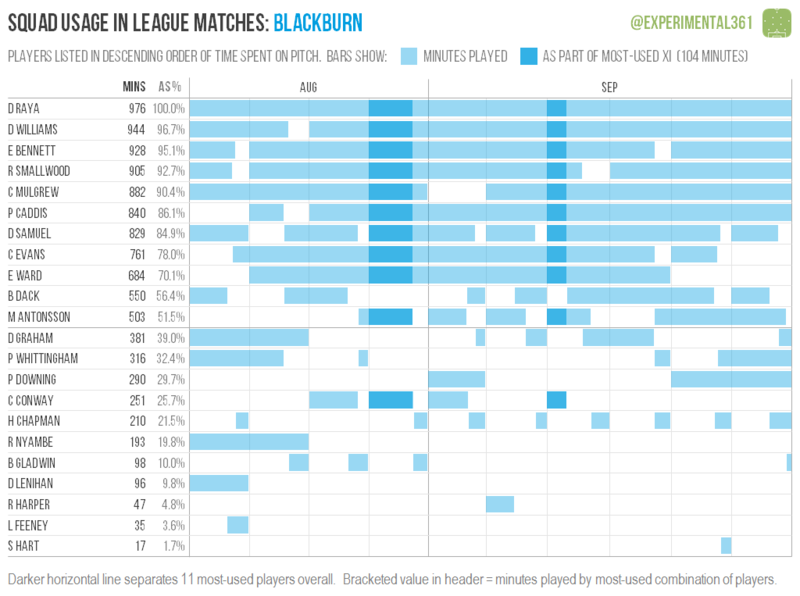 Bury have already used 30 different players this season, starting 29 of them (which is five more than any other team), so it’s unsurprising that they’re one of two sides in the division (the other being Bristol Rovers) who have no ever-present players. 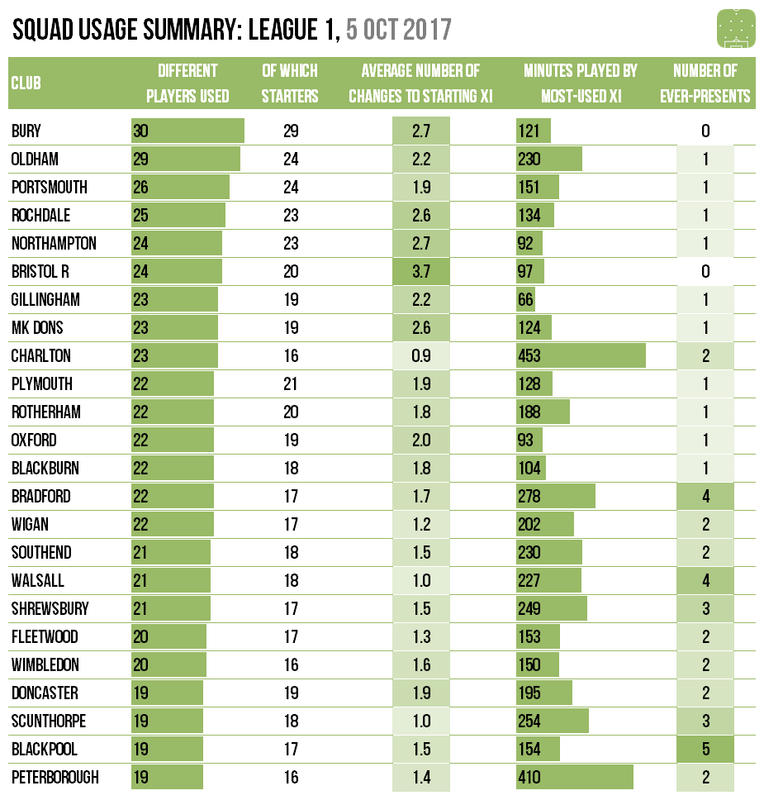 While Rovers have been more restrained in the number of players they’ve called upon, they’ve been rotating the squad heavily. 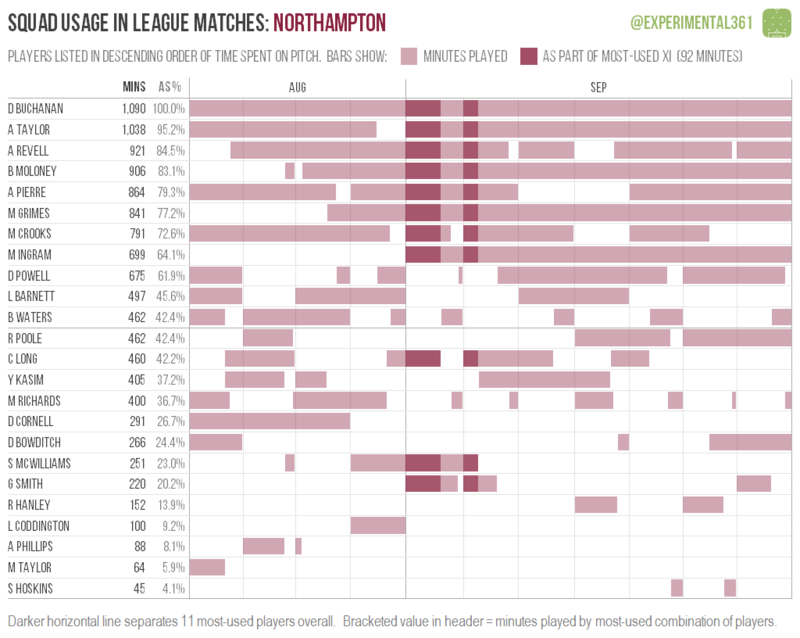 Darrell Clarke has been making an average of 3.7 changes to the starting line-up every match, which is the highest by some distance. 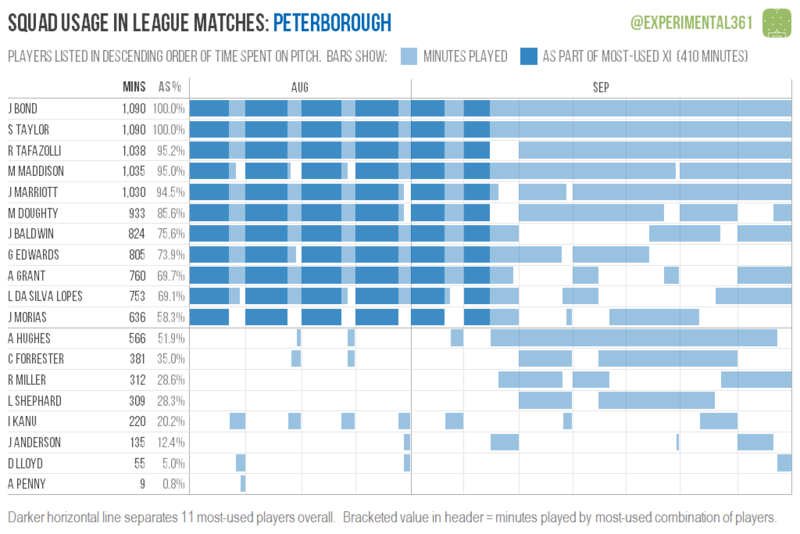 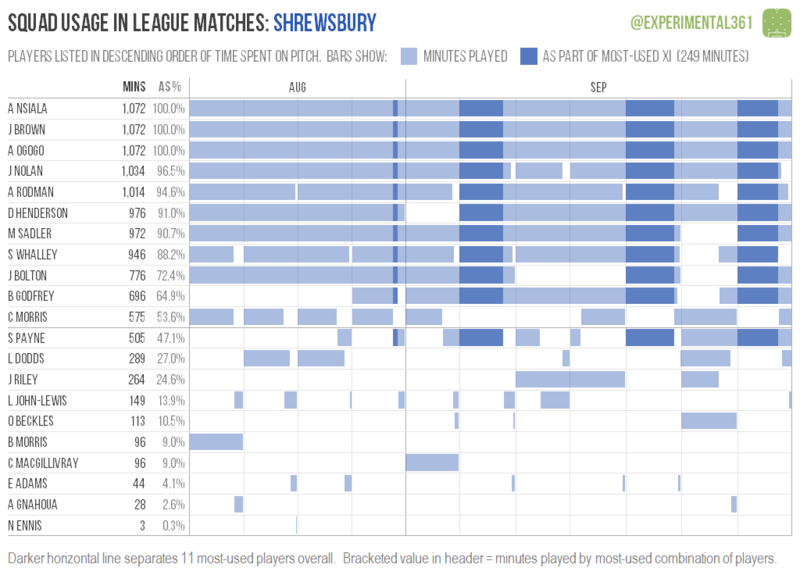 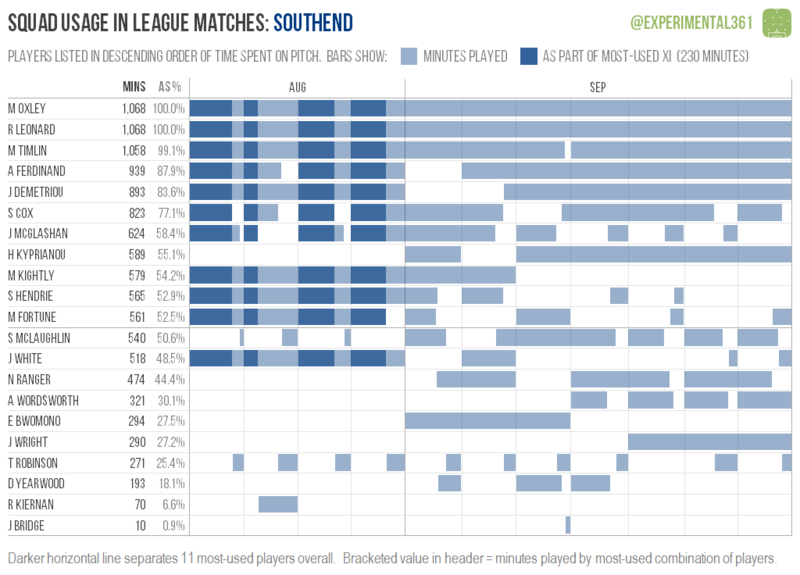 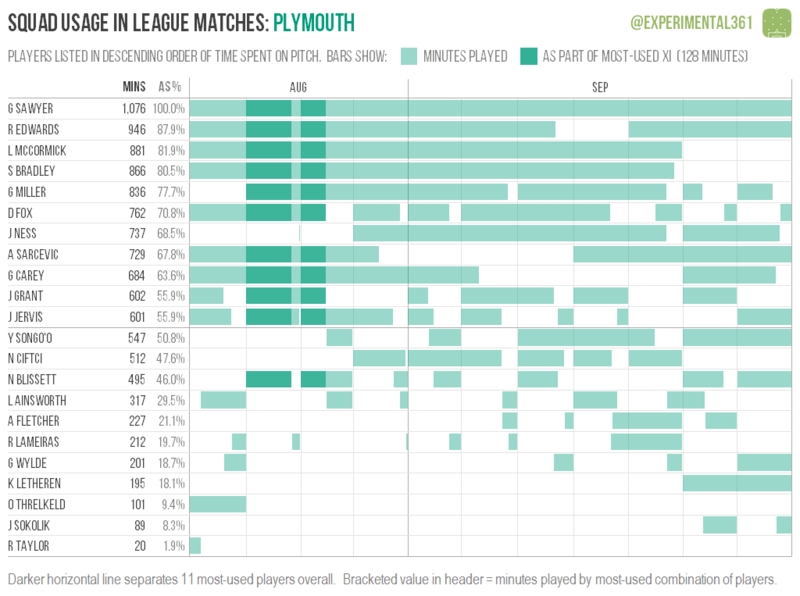 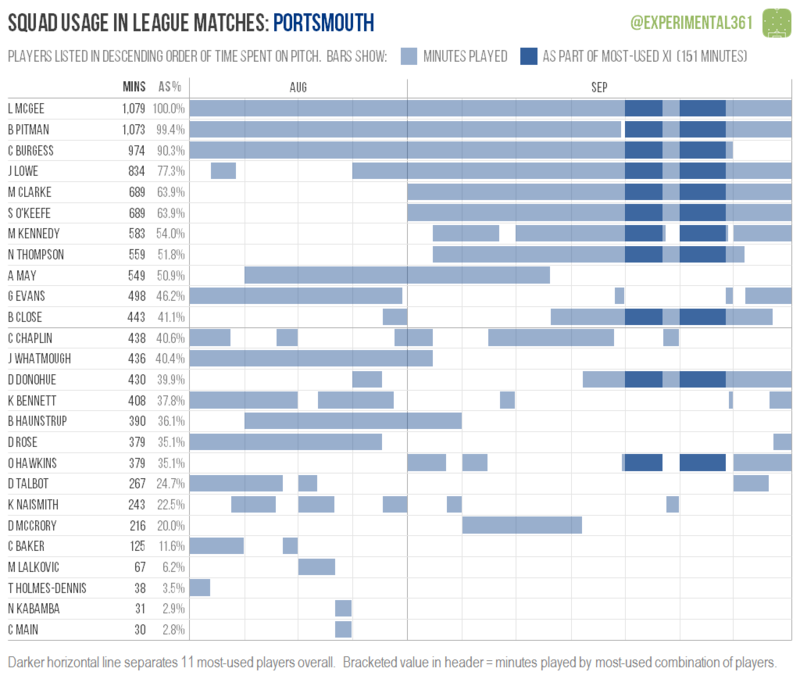 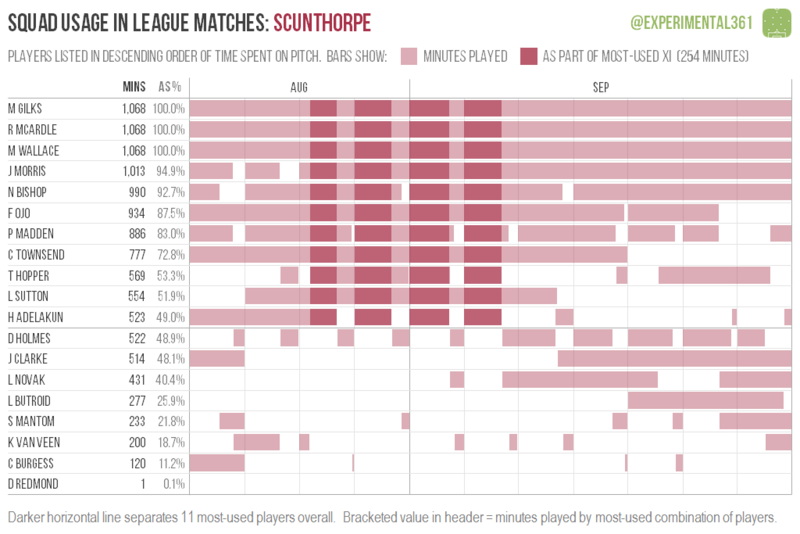 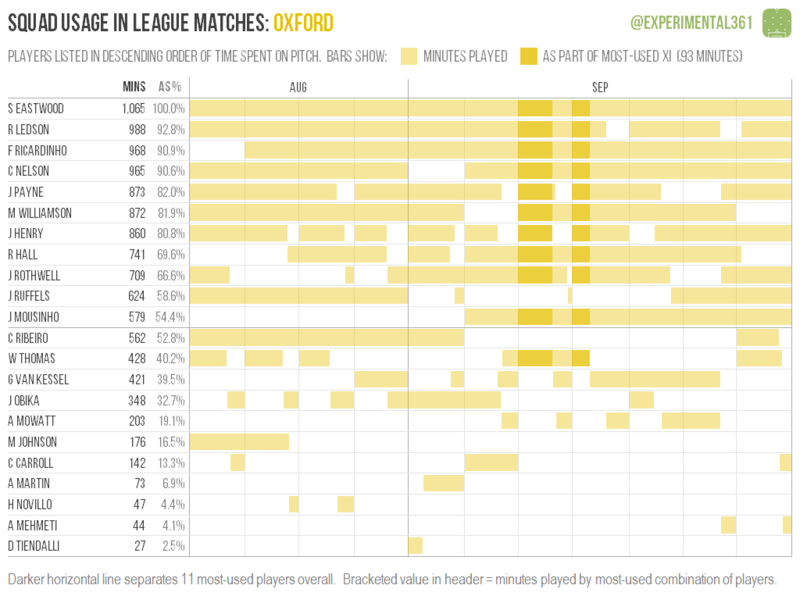 Peterborough are often used as a byword for chaos on this blog due to the traditionally high amount of shots in their matches, but they’re a model of stability here with just 19 players used and the same 11 players featuring together for a combined 410 minutes (second only to the 453 that the most-used Charlton combination have racked up). 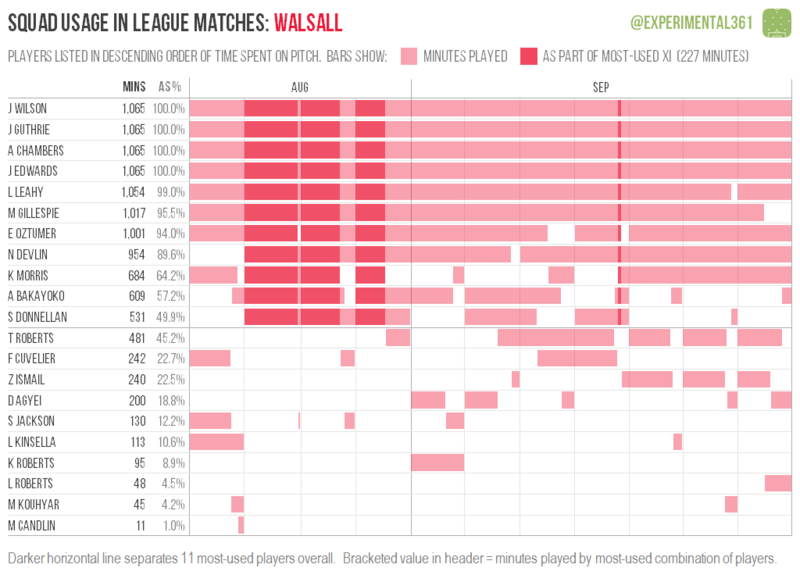 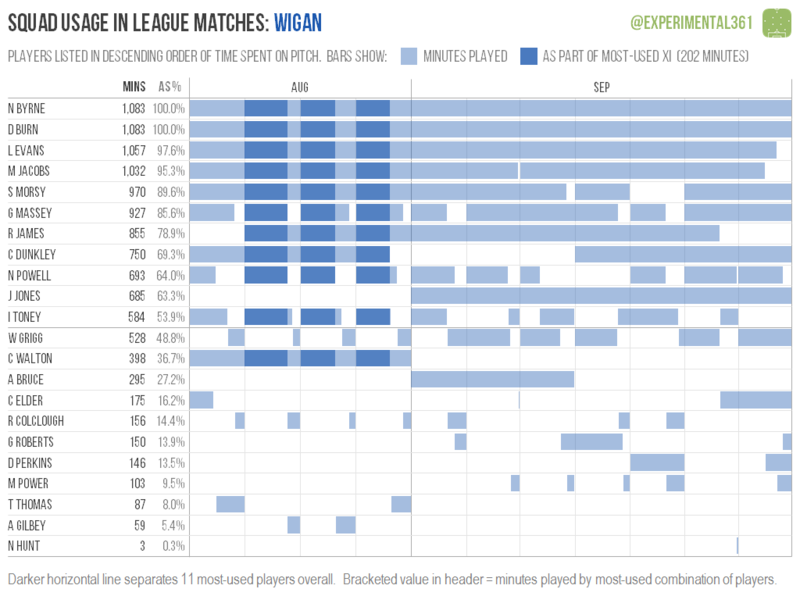 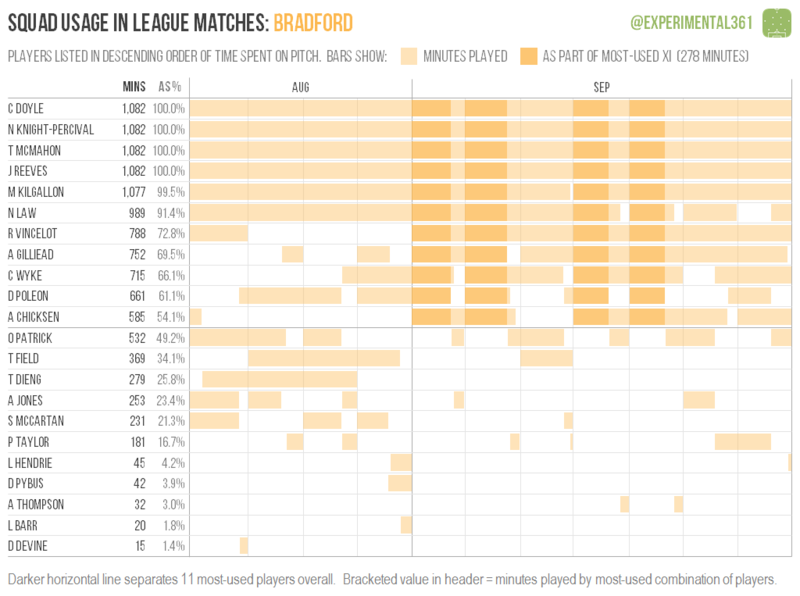 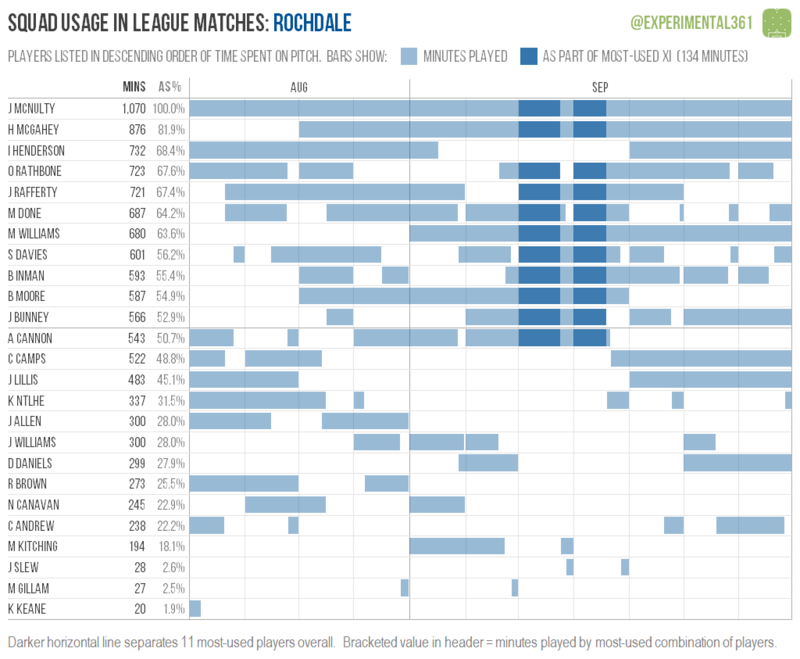 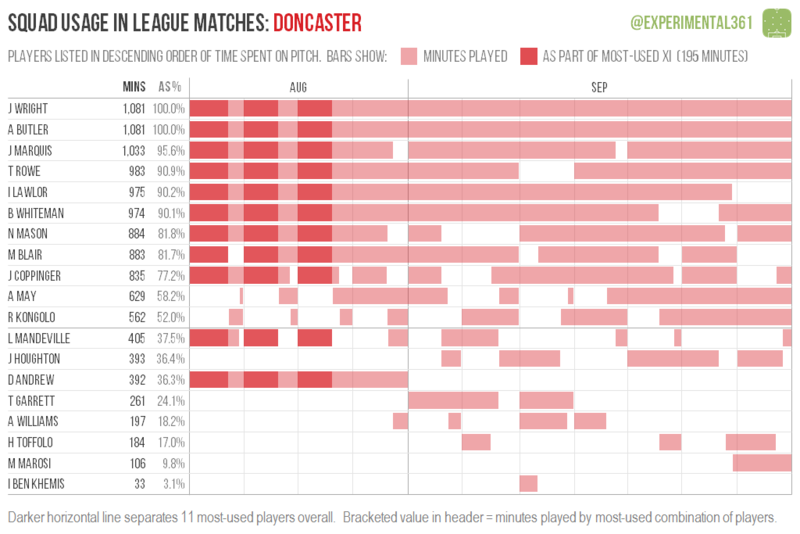 An honourable mention to Blackpool for still having five players in their squad who’ve played every minute of their league campaign so far, although both Bradford and Walsall have four. 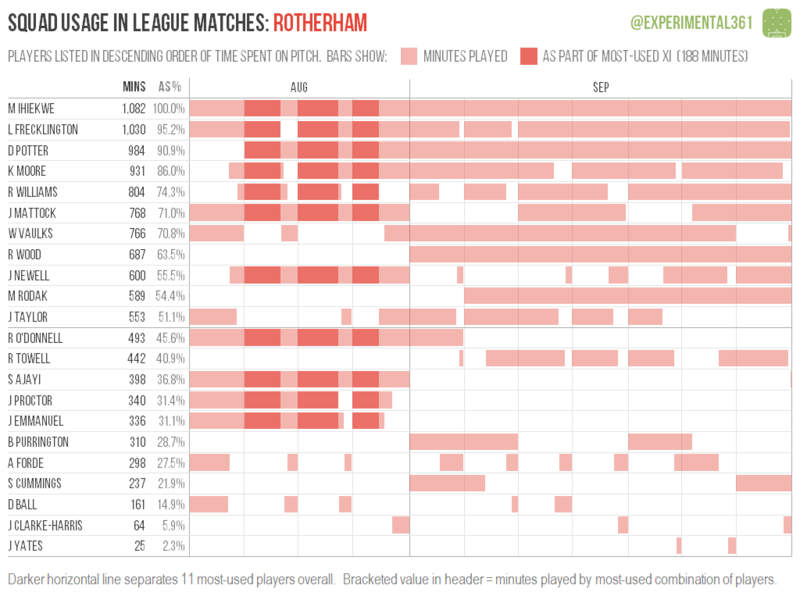 Here are a few quick observations to give you the idea. 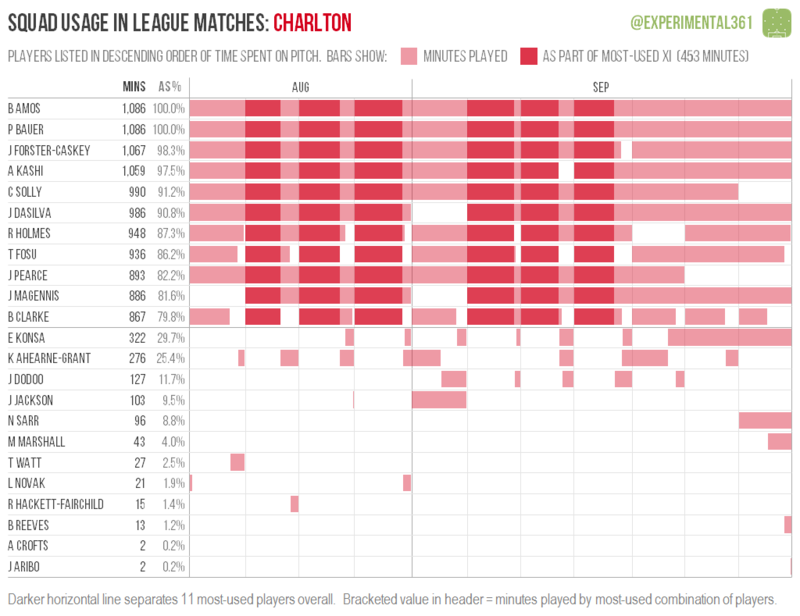 The dark stripes on Charlton and Peterborough‘s graphics show you the six matches in which each has started the same combination of 11 players. 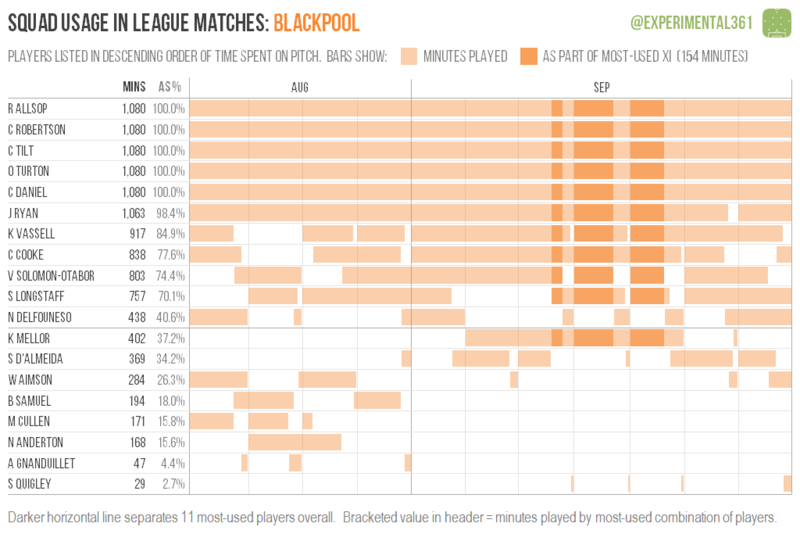 We can also see the top five stripes of Blackpool‘s graphic are completely solid, with the “100.0%”s on the left denoting their ever-present players. 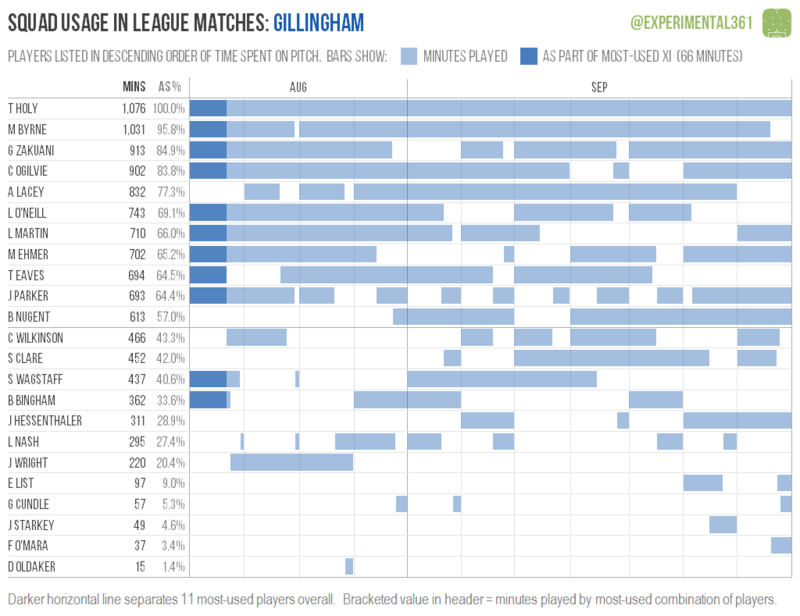 If Jimmy Ryan hadn’t been subbed off in the 80th minute of their draw with Rochdale then they’d have six.